Private social investment in philanthropy supports the achievement of the Agenda 2030 and the implementation of the Sustainable Development Goals (SDGs). A new report launched on Tuesday December 12, in Rio de Janeiro reveals that when this investment uses systemic approaches, impact is greater. The engagement of philanthropy in Sustainable Development Goals (SDGs) is recent. The urgency of greater social impact is one of the points of intersection of the two agendas of work. The report "Philanthropy and the Sustainable Development Goals: Engaging Private Social Investment in the Global Development Agenda" presents a mapping of SDG implementation in Brazil with the support from philanthropy, business and civil society actors. The study is a result of a partnership between national foundations and institutes, such as the Roberto Marinho Foundation, Globo Network, C & A Institute, Itaú, Itaú Social Foundation, Banco do Brasil Foundation and Sabin Institute, and is supported by GIFE, IDIS, WINGS and Comunitas. UNDP and its partners launched the report at an event at the “Museum of Tomorrow”. With the support of Rockefeller Philanthropy Advisors (RPA), it brought together representatives from institutes, foundations, civil society and the United Nations. "We are creating a great network with the participation of the UN and with the SDGs are our guide," said Maristela Baioni, UNDP Assistant Representative. "What moves us all is the fact that we want to ensure a dignity for all and social justice. We are here to broaden integration and synergies for this purpose. " Roberto Marinho Foundation Secretary General, Hugo Barreto, reinforced the importance of the network: "As philanthropic institutions, we need to persevere in our causes and actions and unite in the urgency." The Ford Foundation representative in Brazil, Attila Roque, reinforced the importance of working together to seek efficiency. "Being here together with the UN and other actors is an opportunity to find spaces where we can build bridges," she added. The new report of the SDG Philanthropy Platform informs that Brazil presents a relatively well-structured environment of networks, associations and organizations for philanthropy. In addition, it is one of four countries in the Latin American and Caribbean region to have a formal association of philanthropic foundations. SDGs are known and used by most of the country's philanthropic organizations as support for their decision-making processes. All information presented by the report is based on the 2016 GIFE Census. In addition to the scenario on philanthropy in Brazil, the report "Philanthropy and Sustainable Development Objectives" presents recommendations for the sector, such as improving the regulatory structure of the State to stimulate the philanthropic potential of Brazil; to bring philanthropy closer to civil society, gaining trust and promoting transparency; and broadening the links between different organizations and institutions to strengthen the impact of actions, with the SDGs as guides. According to the document, education is the area that receives the most private social investment in Brazil (84%), followed by professional and citizen development for youth (60%) and arts and culture (51%). The Human Rights area has gained strength in private investments, growing 14% from 2014 to 2016. In Brazil, philanthropic giving focuses on specific groups, especially younger demographics. Donations geared towards gender issues are still very low, accounting for 4% of investments. Racial discrimination issues are less addressed by these institutions receiving only 2%. The distribution of investments in Brazil is still highly geographically concentrated. The Southeast region receives the most resources, followed by the Northeast. Investments in philanthropy in Brazil, in their vast majority, deal with projects with limited impact on the country. The volume of philanthropic investments in 2016 was $ 2.9 billion reais, which represents 0.23% of national GDP. In the United States, by comparison, the share of GDP donated is 2%. This volume of Brazilian investments is a result of a 19% drop from 2014 to 2016. 49% of philanthropic investments total up to R $ 6 million. Although this is significant, considering the wealth of these organizations, it is below the sum necessary and expected. Philanthropy in Brazil is concentrated in organizations and companies, with little volume of individual donations. The director of the UNDP’s International Istanbul Center for Private Sector in Development (IICPSD), Marcos Neto, officially launched the Report during the event "Engaging Private Social Investment in the Global Development Agenda". "We have a common narrative and we have a responsibility. We can and should work together. The report and this meeting demonstrates that the challenges are big, but the opportunities are even greater,” he added. The gathering of strategic actors was an opportunity to discuss the findings of the report and also to share good practices. The debate was divided into three discussions: 1) the exchange of experiences on innovative financing mechanisms and how private social investment can support the means of implementation and leverage funding; 2) how to scale solutions and results; and 3) the need for metrics to monitor and evaluate the effectiveness and social impact of private social investment. Throughout the morning, key guests presented success stories related to the support of their institutions and foundations for the implementation of SDGs. Among them were Instituto Humanize, Vox Capital, GIFE, TV Globo, Instituto Alana, Comunitas, IDIS, Fundação Itaú Social, B3 and IMCSV. "This meeting and the experiences presented show that the possibility of scaling solutions is real," concluded Mr. Neto. The SDG Philanthropy Platform seeks to leverage resources among partners by building channels of intersectoral dialogue and giving beneficiaries and donors more voice in the national ODS implementation plan. The platform is a partnership project between philanthropic organizations, the United Nations, governments, civil society and social impact companies to achieve the SDGs. 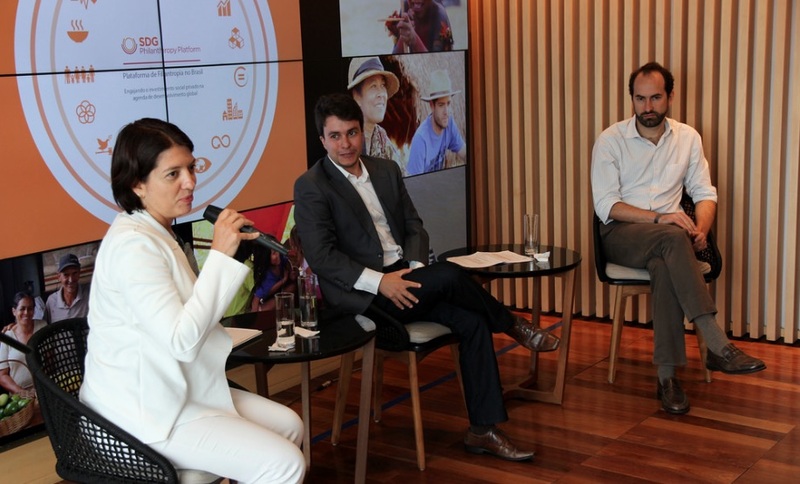 In Brazil, the Platform was established at the end of 2016, under the coordination of companies and partner organizations and philanthropic associations, with the support of UNDP. It became the eighth pilot country to launch the Platform, along with Kenya, Ghana, Zambia, Indonesia, Colombia, the United States and India. During the event, the Brazilian Country Page and Online Community was launched. Check out the report launch event photos: http://bit.ly/2BgQt2l.